100% silk "Crèpe de Chine"
The French word for a silk scarf is foulard. The word is composed by fou (insane) and lard (bacon). About 1500 years ago a Chinese silkworm found his way to France to produce silk in Europe. 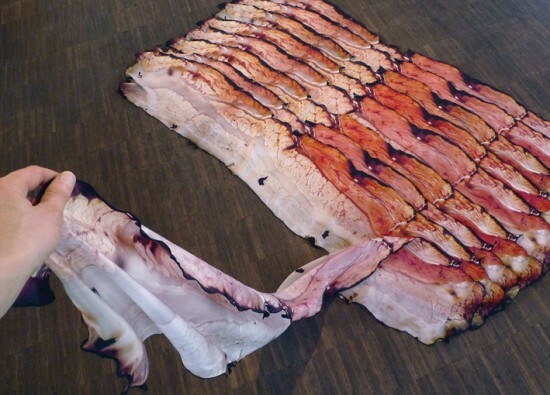 In the country of the « bon vivants » it accidently landed in a butcher’s shop on top of a slice of bacon. Hmm, so soft and tasty, thought the vegetarien with surprise and with verve started to build a cocoon. As the cocoon grew more and more the butcher’s wife, a sophisticated lady, catched an eye on it. Is this bacon going insane, she thought but shortly after she spotted the little worm who found itself in a new paradise. I will make the most beautiful scarf from your silk, she promised and kept feeding the silkworm with the best bits of bacon she could find. After three month she was wearing proudly the most shiny silk scarf that she would call with affection my „foulard“. Tell your friends about Fou Lard! Welcome to the store of Natalie Luder Design.